Cool! 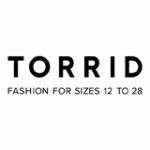 Save an average of 20% on Torrid with 11 Coupon Codes, and 24 Deals! Torrid is a fashion retailer of plus sized apparel that sells fashionable underwear, swimwear, outer wear, casual wear, foot wear and accessories both online and in more than 170 stores in the U.S. Customers like Torrid's smooth e-commerce and attractive deals on their quality clothing and accessories. Details: Save 10% on your purchase with free divastyle membership. Restrictions may apply. Details: $150 off $300 haute cash. Ends 07/28/2013. Details: Take 30% Off Sitewide. Plus, save an extra 10% off with code. Expires on 2/10/14. Details: 25% Off with Denim Purchase. Expires on 11/12/2013. Details: Shop now and get select tops for $12.48 and up. Details: Save 10% off your purchase. Excludes clearance items. Ends 1/26/14. Details: Get 25% off Lingerie plus an extra 10% off with code. Details: Save 10% off your order with code. Excludes clearance. Ends 11/14/13. Details: Save 10% off your purchase with code. Ends 2/26/14. Details: Hundreds of New Markdowns Added to Clearance! Up to 70% Off. Details: Shop Now and Earn $25 in Haute Cash for Every $50 You Spend. Details: Get $10 Off Select Fashion Tops. Limited Time Only. Details: Save 30% on Summer Skirts. Valid for a limited time. Details: Save 30% on select Fashion Tops and Receive $6 flat Shipping. Click to activate. No code required. Details: Save Up to 60% on Clearance Items. Click to activate. No code required. Details: 15% Off Your First Purchase with the Torrid Credit Card. Details: Save 30% on Select Tops. No coupon code required. Details: Get up to $22 Off Select Bottoms. Details: Enjoy $6 flat rate shipping on your order. Details: Shop now and save up to $17 off dresses. Limited time only. Spend Haute cash this week! Details: It is HAUTE Cash time!!! This week only! Details: Get up to $26 Off Select Outerwear.